An extremely rare and little-known U. F. Grant manuscript that is nearly impossible to find nowadays. Devin Knight has taken the original text, revised it and updated it with various annotations for today's performers. He explains and deals with issues that Grant failed to mention in the original release. 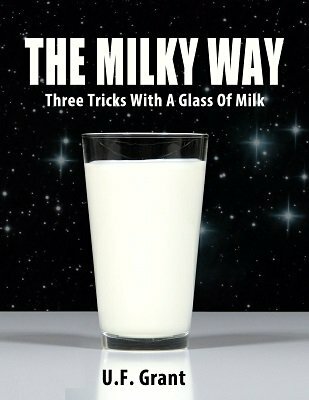 This e-book teaches you three great U. F. Grant tricks with a glass of milk! The methods are typical of Grant's thinking. 1-Here & There: A homing milk effect. Show a glass of real milk, cover it with a paper tube. Pour the milk back into a pitcher. When the tube is removed, the glass is full of milk again. 2-A Boy & Glass Of Milk: A glass of COLD milk is shown and a boy from the audience comes forth and drinks it with a straw. The milk is then pumped from his elbow back into the glass. A poor man's version of the comedy funnel trick, without having to own the special funnel. 3-Triple Change: A banner effect that is great for educational school shows. A glass of milk is poured out and changes to a glass of water, which in turn changes to a glass of cherry soda. Finally, the cherry soda changes back into milk. Includes nutritional patter by Devin Knight for use in school shows. No dangerous chemicals are used to effect the changes. All of these effects are easy to do. Complete detail instructions explain how all three are done. Here are three new effects you can add to your shows for an extremely low cost. These are effects not seen nowadays. A must-read for U. F. Grant fans, includes a scan of the original ad for the manuscript. An ad seldom seen and a must see for magic history buffs. These three entertaining effects with real drinkable milk ( Yes: real fresh cold milk! ) - in a real glass - have been revived and modernized from a lost U.F. Grant description. They can be performed for adults and children, and two of them are made for using at least two participants at a magic show. They are baffling. Devin explains how to inexpensively make the props yourself, and has figured out how to always keep the milk fresh and cold. His instructions for performance are clear and well written. This really is a lost and unattainable manuscript, and you will enjoy performing Devin’s updated versions of these three effects. Don’t pass this up. These effects could be the hit of your magic show.